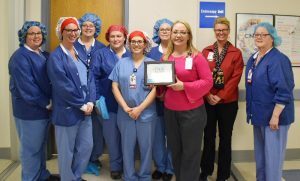 OSWEGO – Oswego Health’s Surgery Center has earned the prestigious CNOR Strong designation, signifying that the members of its surgical services nursing staff members have demonstrated clinical knowledge, experience and judgement within their specialty, perioperative nursing. From left are RN Nurse Educator Jody Wood; Lauren Miles, RN; Lorrie Galletta, RN; Brandi Leaf, RN; Cathy Bulger, RN; Karen D’Amico, RN; Director of the OR & Surgical Services Shannon Campbell; Oswego Health Vice President & Chief Nursing Officer Valarie Favata; and Terri Lutz, RN. Absent from the photo were RoseMarie Rockwell and Theresa Trapasso, RN. To earn CNOR Strong certification, at least 50 percent of the surgical nursing staff must have obtained the individual CNOR certification. To be eligible for the prestigious individual certification, leading to the CNOR Strong designation, registered nurses must be currently working in perioperative nursing in the area of nursing education, administration, research or clinical practice. They are further required to have completed a minimum of two years and 2,400 hours of experience in perioperative nursing, with a minimum of 50 percent in the intraoperative setting. Once they achieve these requirements they can sit for a 200-multiple choice examination that covers nine related subject areas. CNOR certified nurses are committed to providing the highest quality care to their surgical patients and possess a have a greater confidence in their practice. They have mastered perioperative nursing standards and promote a culture of professionalism and improve patient outcomes. The letters, CNOR are not an acronym, but rather indicate that an individual has demonstrated the knowledge and skills that denote competency in the specialized field of perioperative nursing.